Hula Hoe - The Best Gardening tools are the Simplest. The Hula Hoe, also called a dutch or stirrup hoe, is the savvy gardener's best kept secret. Check out this simple, must have, gardening tool! Of all of the tools we used as organic echinacea growers, the hula hoe was the one I couldn't live without. Organic farming requires a lot of weeding and this simple tool turned what would otherwise have been a 6 hour weekly weeding marathon into a 1 hour session. I'd never heard of the dutch hoe (that's what my friend called it) before a friend loaned one to me when we embarked on the echinacea journey. It quickly became a favorite of my husband and myself and we've never been without one since. It was surprisingly hard to find this tool back in 1999 and amazingly, it still isn't that easy. We had to go to the big city (Calgary) to find one at Lee Valley Tools after trying every local garden and farm supply place in our area. The hoe works a little differently than the regular garden hoe. The blade of the hoe slides about a centimeter (half inch) under the soil. It cuts off or pulls out the weeds (depending on their size) with a single pass while leaving the soil and roots undisturbed. Additionally, because the the stirrup doesn't turn the soil, you lose less moisture from your garden. 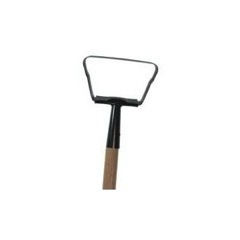 The Flexrake Hula Ho is the best choice for "stand up" gardening and large garden plots. The long handle has a good reach allowing you to easily get to the weeds without bending. For "sit down" gardening, raised beds, container gardens and small areas, there's the Flexrake Mini Hula-Ho . A smaller version of the original hoe. Gardeners are loving this little guy and consumers have ranked both the Flexrake mini and the full sized Flexrake very highly.